Registration has opened for the only international powder and metal injection molding conference of the year, MIM2017. GE has agreed to buy the controlling shares of Arcam AB of Sweden following the conclusion of the extended public tender offer which ended on 10 November. 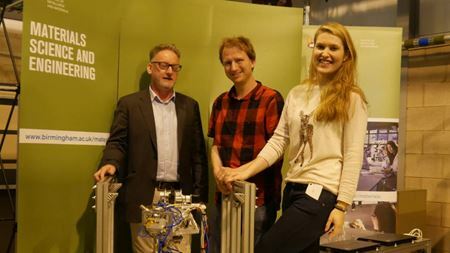 The Fraunhofer Institute for Laser Technology has developed a low cost unit for selective laser melting (SLM). LPW Technology Ltd has installed a TRUMPF TruPrint 1000 metal additive manufacturing (AM) machine. GE plans to invest US$10 million in two educational programs aimed at developing future talent in additive manufacturing (AM). Methods 3D has expanded its additive manufacturing (AM) presence by completing seven AM laboratories located across the US. 3D printing specialist ExOne reports that its Q3 revenue grew 47% over Q3 2015 to reach US$13 million. 3D printed technology has helped run a large power plant run by GE near Berlin, Germany, according to the company. Laser systems manufacturer Trumpf has developed two new 3D printers – TruPrint 3000 and TruPrint 5000. Additive manufacturing (AM) specialist Arcam says that it now offers 3D printing with cobalt-chromium (CoCr) using its Arcam Q10plus machine. Auburn University, based in Alabama, USA, has established a new center for industrialized additive manufacturing (AM). GKN Sinter Metals has set up a new blog covering innovations, trends and news in the field of powder metallurgy. ADAPT, an AM research consortium based in the US has invited Dr Wayne King to speak about AM at the Colorado School of Mines campus. The EPMA has issued the first call for papers for Euro PM2017, taking place in Milan, Italy from 1-4 October 2017.